Already popular among broadcast journalists, musicians, front of house engineers, theatres, churches, television and film productions, DPA Microphones continues to diversify its product offerings with its new MMA-A Digital Audio Interface. This latest preamp offers unprecedented audio quality for live and mobile journalists in the field. Working together with any iOS device, Mac® or PC computer, broadcasting or recording crystal clear sound anywhere in the world is easier than ever. Journalists around the world are already using their smartphones to capture the news. It works fairly well because today’s phones are capable of taking high-quality pictures and videos. The component that is missing is high-quality audio. For news broadcasts, it is equally important to have audio quality that matches or exceeds the video for the message to be understood. This is exactly the challenge that the MMA-A solves. When used with a DPA microphone, the MMA-A is able to capture or stream audio in quality previously only available in the studio. When it’s not possible to have an experienced sound engineer on site, the MMA-A can act as a ‘mini sound engineer in your pocket. The MMA-A Digital Audio Interface is a high-quality, two-channel microphone preamp and A/D converter offering mono, dual and stereo capabilities. This flexibility allows a journalist to use the equipment for any unexpected situation that might arise during their day. Whether it be a two-channel interview situation or a session of recording ambience sound in stereo, the MMA-A makes it easier for journalists to do their job. The MMA-A comes with interchangeable lightning and USB cables for connectivity. Its MicroDot inputs allow the MMA-A to be connected to all DPA miniature microphones, including the d:screet™ Miniature, d:fine™ Headset, d:vote™ Instrument and even the d:dicate™ Recording microphones with the optional MMP-G preamp. “This is the first pocket-sized digital audio interface that can deliver sound that rivals studio recordings,” says René Mørch, Product Manager at DPA Microphones. “The MMA-A Digital Audio Interface was designed with broadcasters and mobile journalists in mind, but can also be used by other content makers for recording music, filming on location and during both live and recorded broadcasts. With this interface, users can portably record and stream clear and professional audio from the connected microphones. 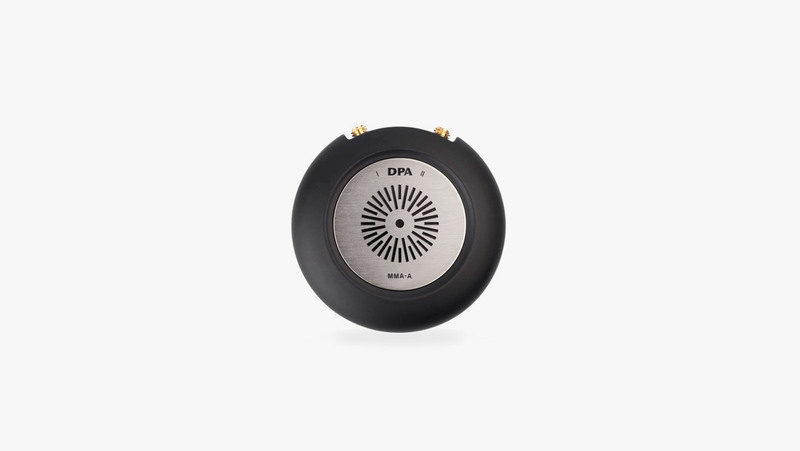 At about two inches in diameter, the MMA-A Digital Audio Interface is ultra-compact, easily fitting in the users’ pocket. It provides best-in-class audio quality and is controlled through a remote application on any iOS device. An exclusive DPA app is available for download from the Apple® App store. The app makes the users’ job even easier, allowing them to store gain settings and low-cut filters for ongoing and future personalized use in dedicated presets. Third-party applications can be used to accomplish specific tasks, including but not limited to live broadcast and high quality recordings. The MMA-A solution is available from end of May 2017. The launch of the MMA-A Digital Audio Interface is just one of a range of planned activities that support and celebrate 25 years of amazing sound with DPA Microphones. During this anniversary year, DPA is planning a number of launches, campaigns and events to reach out to audio enthusiasts and ensure that they experience unparalleled sound.